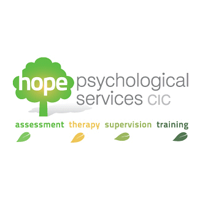 Hope Psychological Services reflect on their experience of the Social Value Action Learning Programme delivered by Development in Social Enterprise to assist ten VCSE organisations complete their first impact measurement exercise. “We were a relatively new social enterprise at the time of joining the action learning group and saw it as a timely opportunity for a few reasons,” says Nathan Laxton, Director of Hope Psychological Services. “As a Community Interest Company (CIC) we are required to report on our social impact so we hoped that an impact study would help us to meet that legal obligation, but also, for our own benefit, we wanted to know that we were achieving what we were set up to do. There was a commercial motivation too – at the back of our minds, if we are to expand our services in the future, we will need to tender for contracts. Evidencing social value to procurement teams is important, so participating in programme was about preparing for the future. “There were group meetings every couple of months with other organisations also going through the process and bits of homework in between. To begin with, it was daunting looking at the proxy databases which would have informed a Social Return on Investment exercise which several members were initially exploring. To gain focus whilst trawling through the sea of data out there was a challenge, but once we had decided to concentrate on client journeys and distanced travelled, things became more manageable and we were able to make good progress. “Going through the process with other organisations was very useful. Firstly in terms of having regular meetings to see what other members were doing, bouncing ideas off one another, but also for the access to expertise from knowledgeable practitioners which was great. With their guidance, we were able to apply what we had learnt to a small scale study of our clients who had accessed Cognitive Behavioural Therapy (CBT) over the past 12 months to deal with issues such as depression and anxiety. “It’s still early days but the findings so far have confirmed that we are having the desired effect on mental health recovery for our clients. We’re having a much greater impact than we predicted in terms of work and social confidence. CBT has enabled them to remain within employment which generates huge cost savings across a range of public services and we’ve also seen some clients – more severe cases – feel more able to engage with others again and venture out of their homes. The range of progression has been quite dramatic. “We now have the tools and systems in place to get a direct measure of how we are doing in terms of our vision and CIC status. Our client forms routinely gather data at key milestones and by doing this year on year we will build a strong evidence base of client outcomes which will support bids and help us to enhance our services.